PiST/// 7-24, her ayin 7'sinde acilip 24'unde sona eren ve 7 gun 24 saat izlemeye acik bir vitrin sergisi. Daha once Osman Bozkurt ve Banu Cennetoglu'nun da fotograf yerlestirmelerinin sergilendigi bu bagimsiz vitrinde 7 Aralik 2006 - 24 Aralik 2006 tarihleri arasinda Linda Herzog'un "Mihriban" isimli fotograf yerlestirmesi sergilenecek. Linda Herzog, Zurih, Isvicre'den gelen bir fotografci. 2004 yilindan beri Istanbul'da yasiyor ve Turkiye'yi gezerek fotograflandiriyor. Mihriban, Haziran 2006'da Afyon'da cektigi bir fotograf. Linda ilk defa bir isini Turkiye'de sergiliyor. 2005 yilinda yayinladigi "Birmingham, Istanbul, Zurich" isimli fotograf kitabi Isvicre'nin en guzel fotograf kitaplari arasinda secilen Linda Herzog, Turkiye'de cektigi fotograflari da yeni bir kitapta yayinlamak istiyor. Not: Ekteki gotuntu "Mihriban"dan bir detay. PiST/// 7-24 is a window display that opens on 7th of each month until 24th and exhibits work for 7 days, 24 hours. 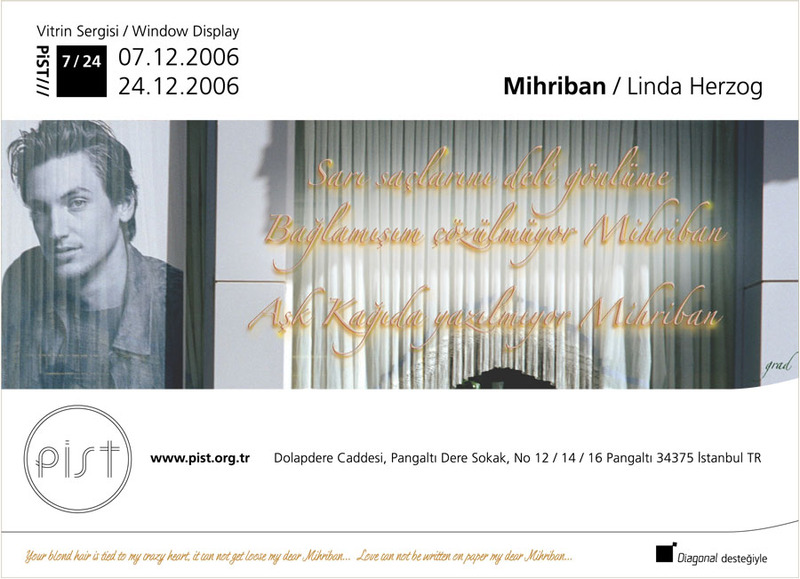 Linda Herzog's "Mihriban" will be exhibited there from 7th of December, 2006 until 24th of December, 2006. 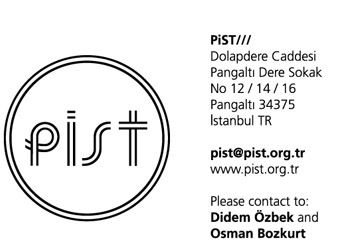 Osman Bozkurt's and Banu Cennetoglu's works were the previous shows in PiST/// 7-24. Linda Herzog is a photographer coming from Zurich, Switzerland. Since 2004 she lives in Istanbul and travels around Turkey to photograph. Mihriban, is a photography she has taken in Afyon, in June 2006. It is the first time that Linda exhibits her work in Turkey. Her photography book published in 2005, "Birmingham, Istanbul, Zurich" was selected as one of the best photography books in Switzerland, in 2005. Linda Herzog aims to publish her photos from Turkey in a book as well. PS: The image is a detail from "Mihriban"